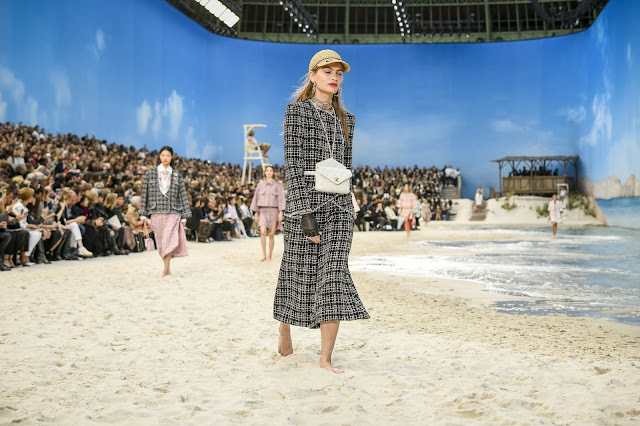 Chanel constructed a beach to serve as the backdrop for the Spring 2019 show. 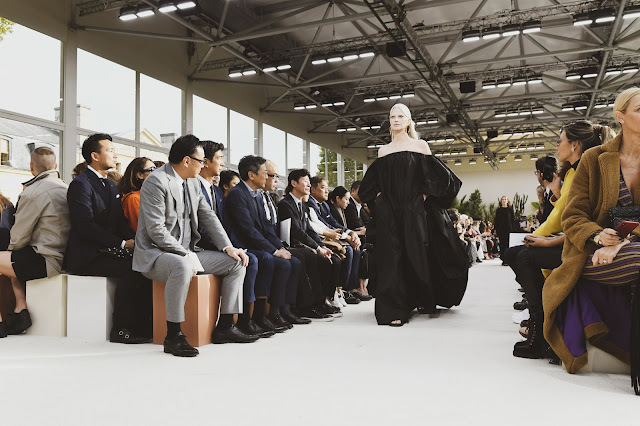 With sand borrowed from a local quarry, pistons gently pushing waves, lifeguard outposts and a boardwalk, it was the grandest set of fashion week. Hey, what better way than to impose the fact that it's a $10 billion company? Escapism has been a recurring motif during fashion week. In fact, it dates back a number of seasons, to the time of the manic 2016 US presidential election. Since then, designers have imbued their work with a sense of charming ease, summer-ready vivacity, and a frisson of joie de vivre. Karl Lagerfeld is at his best when he simplifies things, visualising his inspirations in their purest form. His references to the beach were obvious but they didn’t look trite. He reissued the signature bouclé in sorbet shades, encased the double-Cs on necklaces with golden life buoys. He applied parasol prints to dresses, paired swimsuits with jeans, cycling shorts with tweed jackets, and topped it all off with straw hats. 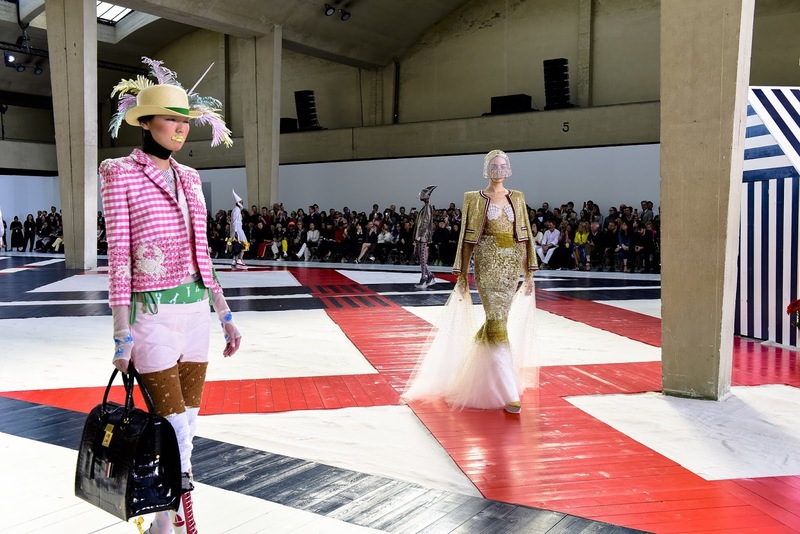 It was the zesty, predictable fun you’d expect from a Chanel show but it was carefree and elegant, youthful and composed. It was refreshing like lemon sorbet. Thom Browne, the American designer who recently sold the majority stake in his business to Zegna for $500 million, was also drawn to the seaside. His weren’t as outwardly exotic, he transported audiences to what could’ve been Cape Cod. Lagerfeld and Browne painted the same landscape but produced two vastly different paintings. Browne’s penchant for satire is brilliant. He creates runway fantasies which mock preppy WASP culture but this time around it felt too self-indulgent. The workmanship was tremendous, incomparable even. But the narrative he wove—recognisable as the true meaning might’ve been—belied the ice-cream colours. Watering can masks, lobsters and mermaids, and watermelon fascinators, on paper, read cartoonish fun. But the result was much bleaker. It could easily be the subject of the next season of FX’s American Horror Story. With models trussed-up, bound and subjected to impossibly high stilettos, it was another questionable portrayal of women we’ve seen over the past 28 days. (Hedi Slimane, at Céline, is another offender.) There was no relief in the denouement, no bird set free moment, no hearty laughter. The girls were fastened tightly, emancipation across the water. It was at Valentino where Pier Paolo Piccioli objected to the idea that the beach is the ideal milieu for freedom. He believes women should be free wherever they may be. The use of colour was gorgeous as always—black and white, red and persimmon. It evolved into an explosion of patterns. For its glossy exuberance, Piccioli’s work—with some exceptions—stayed within a sophisticated bracket. A pink dress with a reverse print of flamingos, edged with pink feathers? Fabulosity defined. Piccioli’s producing exemplary, desirable work at Valentino. He’s tapping into pleasure centres with joyous, passionate fashion. Few, nowadays, can rise to the challenge of solving problems while also having fun. Beach, boardroom, or big city—Piccioli is your man.